Learn how to use SmartrMail's multiple templates feature. If you've already successfully designed your first email template, you may wish to design additional ones. This article will take you through the steps to achieve this. Having additional templates is great if you want to change the way certain emails you send look from others. For example, you might want to have a different logo or header links for your newsletters than your auto product emails. Likewise, you might also want to create a different look and feel to your emails you're sending to different customer lists. To add a new template, first navigate to your Design page. You can access the Design page from the menu at the top of your screen on any page within SmartrMail. Once you are on the Design page, you can add a new template by clicking on the "+ add new template" link in the top right of the page. Clicking on this will duplicate your existing template. Once you've clicked the link, you'll be prompted to name your new template. It's best to keep your templates organised by giving them names like 'Newsletters'. Once you've named your new template, simply click on the blue 'Create' button. Clicking on this button will enable you to edit the newly created template straight away. You can always tell which template you're editing by the name in the top left, as shown below. From here you can customise your new template how you want by following the same steps you took when you created your original template. All changes are saved automatically. 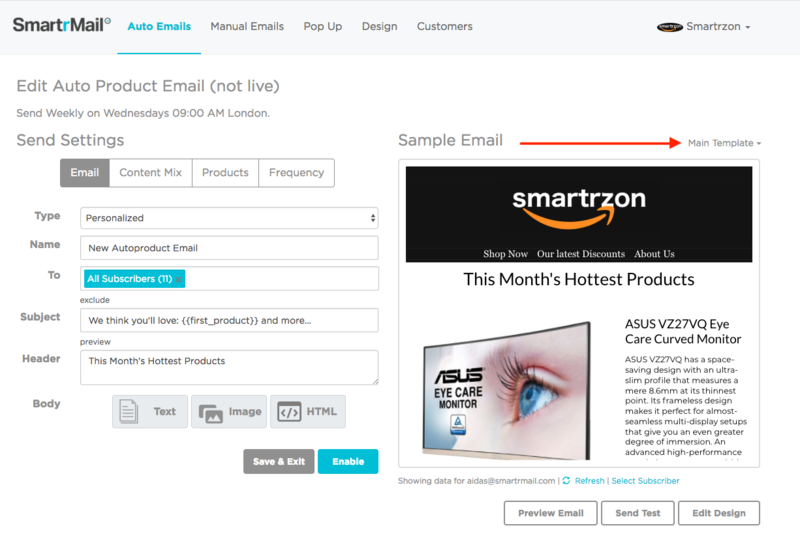 By default, SmartrMail will select your 'Main' (first) template when creating a new email. If you wish to use a newly created template, you'll need to select this so that SmartrMail knows which template you want to use. For manual emails, as well as welcome and automated flow emails, you can select the template by using the drop down menu on the top right of the email preview window. For auto product emails and abandoned cart emails, you still select the template to use with the drop down list on the top right of the email preview window, but for these emails, the preview is on the right. Should you wish to delete a template, you first navigate to the template's edit page. To do this you need to go back to your Design page and then select which template you wish to delete by clicking on the relevant link in the far right of your screen. Once you have selected the template you wish to delete, you then simply need to click on the blue 'edit' link in the left. This will present an option to delete the template (along with renaming it).